• Calculate the square foot area of the flower garden. • Calculate how much fertilizer to use. • Apply limestone, if needed according to the soil test recommendation. • Apply fertilizer based on the recommendation and calculation described below. For flower beds, lime and fertilizer recommendations by the UMass Extension Soil and Plant Nutrient Testing Laboratory are provided for a 100 square foot area. Therefore, you need to determine the size of your garden before spreading lime or fertilizer. The length multiplied by the width of the garden will give you the total area. For example, a garden 5 feet wide and 10 feet across would be an area of 50 square feet. Often flower gardens are irregularly shaped and the square footage would need to be estimated. The numbers on a fertilizer bag refer to the percentage of nitrogen (N), phosphorus (P2O5) and potassium (K2O) (in this order) which are the nutrients needed in largest amounts by plants. Fertilizer is not a cure-all for plant problems and must be used as one of the tools for improving growth and health of the plant. To determine how much fertilizer to use, divide the lbs. of the specific fertilizer material recommended in the soil test result by the percent of that same material in the fertilizer being used. First, convert the number to its decimal form before using percentages in calculations. The soil test recommends 0.25 lb. of nitrogen per 100 sq. ft. and you plan to use a 10-10-10 fertilizer, then this is how to figure how much fertilizer to use to supply 0.25 lb. of nitrogen. 0.25 (lbs. of nitrogen based on recommendations) divided by 0.10 (10% nitrogen in fertilizer) = 2.5 lbs. of 10-10-10 fertilizer to supply 0.25 lb. nitrogen per 100 sq. ft. Most home garden fertilizers are complete fertilizers, which contain the macronutrients nitrogen, phosphorus and potassium. These nutrients are required by plants in the largest amounts. However, phosphorus (P2O5) and potassium (K2O) should be applied only if their need is indicated by a soil test. Phosphorus can be moved in runoff water and poses a threat to water quality. Complete fertilizers formulated for flowering plants often contain amounts of nitrogen less than or equal to the amounts of phosphorus (i.e. 10-10-10 or 5-10-5). This is because phosphorus encourages flowering and excessive nitrogen will stimulate green leafy growth at the expense of flower production. There are several ways to supply nutrients to flowering plants. These include granular chemical fertilizers, which may or may not be controlled-release, water soluble fertilizer and organic fertilizers. Controlled-release fertilizers are also called slow-release or timed-release. Granular fertilizer formulations that are not controlled-release will generally supply nutrients to the plants for about 6 to 8 weeks. During periods of excessive rainfall or frequent irrigation, the nutrients may be leached out of the soil and fertilizer may need to be reapplied. Controlled-release granular fertilizers consist of water soluble fertilizer that is encased in a semi-permeable resin coating. When they come in contact with water, small amounts of nutrients are released to the soil for use by the plant. The rate of nutrient release for most of these fertilizers is regulated by temperature. The warmer the temperature the faster nutrients are released. When the initial fertilizer has been depleted, fertilizer will need to be re-applied. Many of the products for use with flowers will supply nutrients for 3-4 months depending on the temperature and amount of moisture. Some gardeners may also prefer to use water-soluble fertilizer formulations. Water-soluble fertilizers are purchased ready to use or as a concentrated powder or liquid fertilizer that is mixed with water and applied to either the soil, or to both the soil and the plant's foliage. Since the nutrients are in a soluble form, they are subject to leaching (movement through the soil). Because these nutrients are available for only a short period of time, the label of a water-soluble fertilizer will direct you to apply it at more frequent intervals than when using a granular or controlled- release formulation. In the flower garden liquid fertilizer is useful for a quick boost or to supplement granular or controlled-release fertilizers when then they have been depleted. However, most gardeners prefer products that do not have to be constantly reapplied. Organic fertilizers can also be used to supply nutrients to flowering plants. They can be purchased as complete fertilizers or for individual nutrients and as liquids or solid bulk forms. Organic fertilizers are often lower in nutrient analysis and solubility than synthetic fertilizers. So, they may need to be applied at higher rates and greater attention should be given to soil preparation during the initial stages of bed preparation to ensure uniform distribution. The addition of organic matter to very sandy soils or those low in organic matter can be very beneficial. Organic matter will increase both the water and nutrient holding capacity of the soil, moderate soil temperatures, encourage earthworm and other soil organism activity, increase soil nutrient levels, enhance the soil’s structure and make it easier for plant roots to penetrate the soil. Sources of organic matter include peat moss, leaf mold, rotted manure, bagged humus or compost. The use of organic mulch such as straw or bark mulch will also add soil organic matter as it decomposes. Care should be taken when using composts, manures or other materials that are potentially high in nutrients as a source of organic matter. Heavy continuous use of compost can lead to imbalances or excess levels of some nutrients after a number of years. As with any soil amendment, it is advisable to periodically test your soil for nutrient levels, pH and organic matter and adjust your fertilizer and organic matter applications accordingly. Use the amount of fertilizer recommended on the soil test report at the times of year listed below for the type of flowering plants being grown. Note that these are guidelines. Plant health, types of fertilizers, weather conditions, soil types and other factors influence plant nutrient needs and timing of application. For new flower beds, work the fertilizer into the top 4 to 6 inches of soil before planting. For established plantings, spread the fertilizer evenly around the plants and lightly rake it into the soil, then water thoroughly. If possible, pull back the mulch around plants so the fertilizer is applied to the soil and not on top of the mulch. 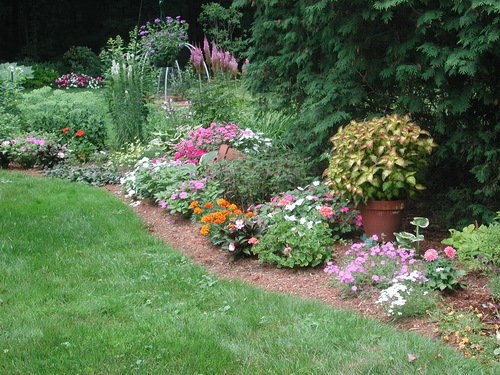 Annuals -Apply fertilizer during flower bed preparation. Make a second application at the same rate 6 to 8 weeks later. Annual selections that will continue blooming into fall may benefit from a third application at the same rate made in late August. Perennials and Ornamental Grasses (new plantings) - Apply fertilizer during flower bed preparation. Make a second application at the same rate 6 to 8 weeks later. Perennials and Ornamental Grasses (established plantings) - Apply fertilizer when growth resumes in the spring. Perennials with long lasting foliage or extended bloom periods may benefit from a second application at the same rate 6 to 8 weeks later. Spring Flowering Bulbs -Apply fertilizer as soon as new growth emerges in the spring. Also apply fertilizer at the same rate when preparing beds in late August or early September. Summer Flowering Bulbs -Apply fertilizer at planting time or, in the case of hardy summer flowering bulbs, when growth resumes in the spring. Make a second application at the same rate after flowering for plants with short flowering periods. For plants with long flowering periods such as cannas and dahlias, make a second fertilizer application at the same rate in mid-July. Roses -Make separate applications of fertilizer in May, June and July. Do not fertilize after mid-July as new growth may be encouraged. It most likely will not have time to harden off properly in the fall and will be very susceptible to winter kill. Wildflowers – Wildflowers that are native to New England's woodlands or meadows generally have low nutrient requirements. Apply fertilizer once in the spring as new growth begins, or during bed preparation.